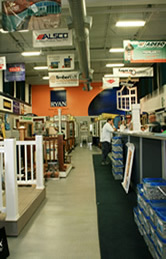 Our showroom/warehouse is conveniently located at 190 University Avenue in Westwood Massachusetts, near routes 95 and 128. Heading South on Route 95/128: Take Exit 13, “University Ave.” and turn left at the end of the exit ramp. Turn right at the lights onto University Ave. Travel approximately 4/10ths of a mile to 190 University Ave. on your left. Heading North on Route 95/128: Take Exit 13, “University Ave.” and go through 2 sets of lights. We’re located 150 yards on the left after the second set of lights. From Route 1, North or South: Turn onto University Ave. (between Analog Devices and Norwood Chrysler). Stay on University Ave., go through one set of lights at intersection of Canton St., (W.W. Grainger is on your right), cross the railroad tracks, and continue straight. We’re located at 190 University Ave. on your right. Click here to enter your starting location for turn-by-turn directions.